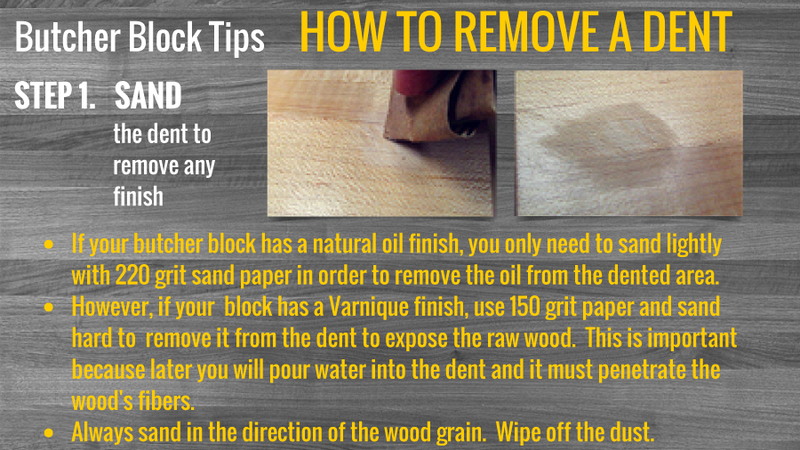 Removing A Dent From Butcher Block Is Easy! We at Butcher Block Co. take great pleasure in helping our customers, whether it is answering their questions or providing solutions to their problems regarding butcher block. Some questions are about basic daily care for their butcher block or how to remove stains and scratches, and others are more complicated issues like how to repair butcher block. Most recently we had a couple customers call in and ask about removing a dent in their butcher block. One customer dropped a heavy object on their top, and another customer had a dent that occurred during installation. While most dents are minor, they can bug you endlessly when you see them every day! So that was the motivation for our blog this week. “The Experts In All Things Butcher Block” are happy to share with you how to remove a dent from butcher block, using an iron! 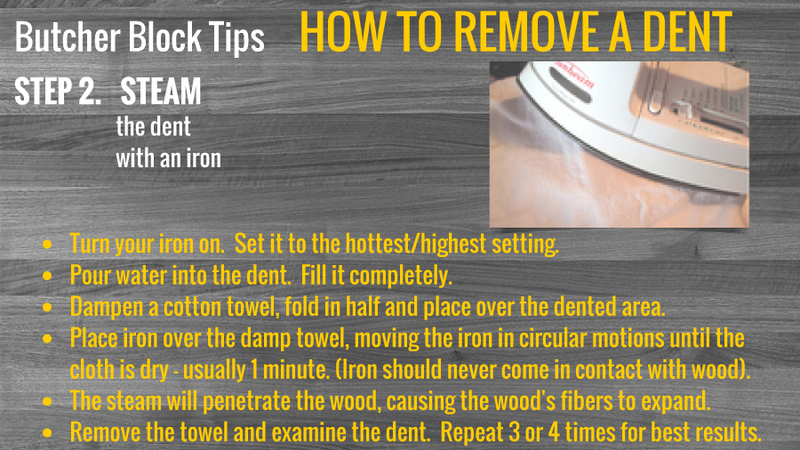 Removing a dent in wood using an iron is easy, really! 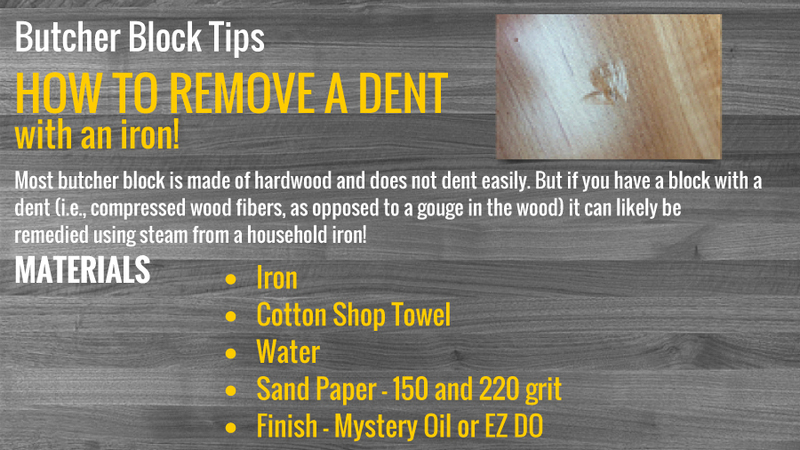 This method of removing a dent from wood is well known by woodworkers, but not so much by consumers. It works best with soft woods that are dented – the dent will totally disappear. With hard woods used to make butcher block, like maple, walnut and cherry, the process still works pretty well. Removing a dent from butcher block with an iron requires that the bare wood fibers be exposed. 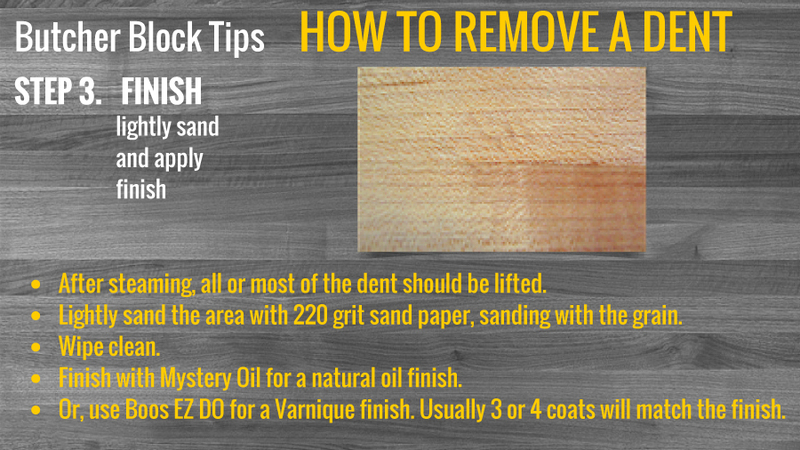 Most butcher block has an oil finish, so it is very easy to sand a bit to expose the bare wood fibers. The challenge is if you have a Varnique finish on the butcher block. You must sand through all layers of the Varnique to get to exposed wood. That will allow the water to be absorbed by the wood and the steam to help lift the dent. Removing a dent from hardwood butcher block will require repeating the steaming process a few times. Removing a dent in butcher block may not work completely, every time, but it can significantly improve the appearance. It is much better than the alternative, which is to see the dent every day and have it bug you. Do you have questions about caring for or repairing your Butcher Block? Let us know. We are happy to assist you. If it is not something we have already blogged about, we could cover it in a new blog! Here is our printer friendly version.